Obama Blasts Trump With 7-Eleven Jibe! President Barack Obama has blasted Donald Trump's recent remarks about women, saying they would be intolerable even for someone applying for a job at a 7-Eleven convenience store. At a rally supporting Hillary Clinton, Obama also urged senior Republicans to formally withdraw their endorsement of Mr Trump as presidential candidate. Many top Republicans have however distanced themselves from Trump when a video in which he boasts of groping women surfaced. Trump has however accused them of DISLOYALTY. He was particularly scathing about House Speaker Paul Ryan whom he described as a "weak and ineffective" leader. 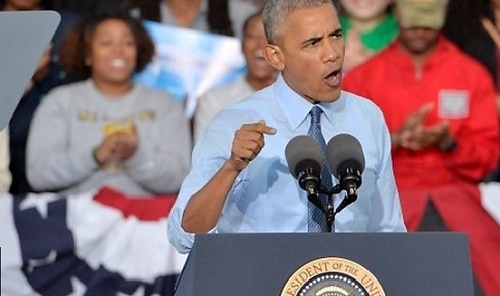 Addressing a campaign rally in Greensboro, North Carolina, on Tuesday evening, Obama referred to Trump's crude remarks about women, saying: "Now you find a situation in which the guy says stuff that nobody would find tolerable if they were applying for a job at 7-Eleven." Obama questioned how senior Republican politicians could still want Mr Trump to be president.